We require a minimum of $200 deposit to hold the puppy of your choice. This deposit also serves as our guarantee that you will be purchasing the puppy specified, therefore the deposit is non-refundable should you change your mind. We want to ensure that anyone leaving a deposit is serious and has taken all the responsibility of a new puppy into consideration. We request to have the puppy paid in full by the time he/she is 8 weeks old. If you need to extend payment past 8 weeks, then there will be additional charges for caring for your puppy. We accept personal checks, money orders, and all major credit cards through Paypal. If you choose to use Paypal, please include the 3% surcharge. We are charged this by Paypal on all credit card transactions. All puppies will remain at our home until they are completely paid for. The link to pay via Paypal is included below. All buyers will have to sign our puppy purchase agreement, which is also their written health guarantee. 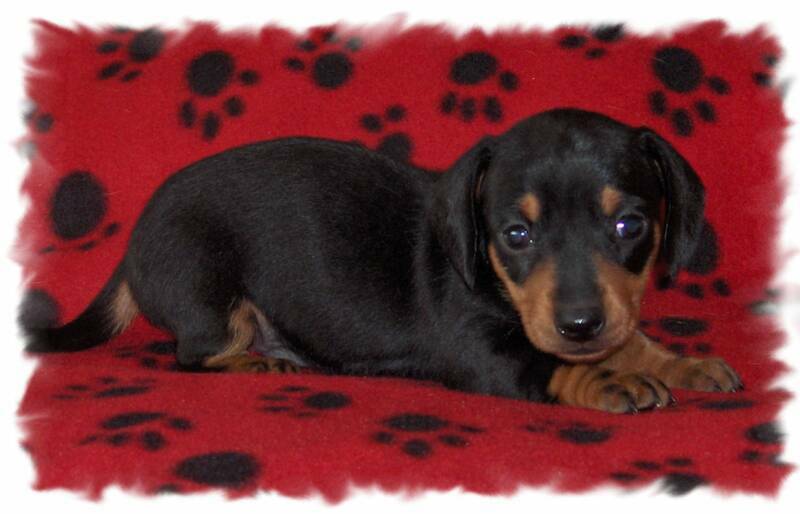 Our puppies are priced depending on their color, coat, pattern, and gender. Some colors and patterns are more rare and are, therefore, priced accordingly. We feel that our prices are very competitive, especially given the quality of our dogs and the extras we offer. We do not sell bargain puppies, so please do not ask! We offer discounts for multiple puppies bought, and repeat buyers. We know that our prices are on the higher end, but we caution you to choose wisely when you are selecting your pet. In the case of a Dachshund, you will have your companion on average for 13-14 years, and in the case of a German Shepherd, 7-10 years. One of the most important things to look for is a written health guarantee. Most pet shops and bargain breeders do not guarantee the health of their puppies. While most puppies are very healthy, there can be occasional genetic defects or rare illnesses. Be sure you are covered. In addition, we always take our new babies to the vet when they are around 5 days old. At this time, they are checked over by the vet and their dewclaws are removed. Because there is an additional charge to the breeder to take the puppies for a vet check and have their dewclaws removed, most breeders won't bother. Another expense related to your new puppy will be continuing their vaccination series. Young puppies will need a series of 4 puppy shots. We start them with a Vanguard Plus 5 vaccination for their first in the series; this shot covers them against parvo-virus, parainfluenza, canine distemper, and adenovirus type 2. Many vets use this same shot and will charge you anywhere from $50-60 per shot. We are happy to continue your puppy's series of shots for $10 per shot, resulting in a huge savings to you for a series of three additional shots. Do not skimp on your puppy's vaccinations because it will protect them from picking up deadly viruses in public places or from other dogs. They need the full series of shots in order to be fully protected. Because we take pride in our dogs health and appearance, we feed them the best food available. All of our adult dogs are fed a combination of raw chicken and Timberwolf Organics or Fromm dry food, We do not feed our adults or puppies cheap food and it is reflected in their coats. Raw chicken is great for our dogs' teeth and it provides many essential vitamins and nutrients, as well as lots of protein. Many of our customers have chosen to come back and purchase Timberwolf Organics or Fromm dry food because of the noticeable difference in their dog's coat. All of our adults, including nursing mothers, are fed Timberwolf Organics or Fromm and the puppies are weaned off onto this food as well. As you can see, it is not cheap to take such great care of our dogs and puppies. We offer many things that bargain breeders and pet shops won't. We offer a written health guarantee; all puppies are vet checked and have their dewclaws removed; they receive their first shot and we will administer additional shots for $10 each; and we feed our dogs and puppies the very best food you can buy. Furthermore, we are state licensed and have been AKC inspected. Most importantly, we want you to be completely satisfied with your puppy. We will always take any puppy or grown dog back and find a new home for them. Please see our lifetime placement policy below. Please make arrangements with us to pickup your puppy on the date they are ready to go. If for some reason you cannot pickup your puppy on that date, we will gladly keep him/her for you for a small boarding fee. We will also continue their vaccinations and de-worming while they are with us. If you have not made specific arrangements to pick up your puppy after two weeks, we will assume that this puppy has been made available for others. You are always welcome to pickup your new puppy here in Parker, CO. Your puppy can be picked up when they are 8-weeks old. However, if you are unable to come to our home, we offer safe airline shipping. We ship throughout the United States at the purchaser's expense. Prices may vary and shipment may be delayed in hot summer months or very cold days. Generally the price to ship in the US is around $250. This price includes airfare, usually Continental, Northwest or Delta Airlines, an FAA approved travel kennel (which you get to keep), a health certificate, and mileage to the airport. We will also include food for the trip as well as enough to get your puppy started at their new home. Pricing for shipping is subject to change at any time and you will be asked to pay the actual costs. Contact us for more information! You will notice that our price to ship is lower than most other breeders. We offer pet sitting services to anyone who has purchased one of our puppies. We will gladly care for your puppy (or now grown dog) for $20/day for one dog, and $10/day for each additional dog. Our home is a safer place for your dog because most kennels carry viruses like kennel cough. Your dog will be let out to play and run with our dogs several times a day for lengthy periods of time. They will be able to socialize while also returning to where they were raised, which is less traumatic than kennels. We do not offer commercial pet sitting services, only requests by our puppy customers. WE RESERVE THE RIGHT TO REFUSE PROSPECTIVE BUYERS. We DO NOT buy or sell puppies from/to PUPPY MILLS, BROKERS, or PET STORES under any circumstances. 1. An AKC registration application. 2. A record of current vaccinations and worming history. Vaccine labels are provided showing lot number & expiration date. Our puppies are vaccinated at 8 weeks of age. If they are still in our possession, they receive shots at 11 & 14 weeks of age. 3. A 7 day money back guarantee for infectious diseases. Verified by your veterinarian & confirmed by our veterinarian. 4. A 12 month guarantee for life-threatening genetic disorders. Confirmed by a veterinarian. Remember, due to their age, your new puppy may not have had all their required vaccinations yet, and must never be exposed to other pets until your veterinarian has verified that all the pets in your home are completely healthy and free of parasites & infectious diseases. Puppies should also not be taken to dog parks or pet stores until their full series of vaccinations has been completed. Under no circumstances should you ever surrender your dog to an animal shelter! If you should ever find yourself in a situation where you cannot keep your companion, we ask that you contact us, and we will gladly take your companion back! Dappled Dachshunds--The "single" dapple pattern is expressed as lighter-colored areas contrasting with the darker base color, which may be any acceptable color. Neither the light nor the dark color should predominate. Nose and nails are the same as for one and two-colored Dachshunds. Partial or wholly blue (wall) eyes are as acceptable as dark eyes. A large area of white on the chest of a dapple is permissible. A "double" dapple is one in which varying amounts of white coloring occur over the body in addition to the dapple pattern. Nose and nails: as for one and two-color Dachshunds; partial or wholly self-colored is permissible. German Shepherd Dogs can stand as high as 26 inches at the shoulder and, when viewed in outline, presents a picture of smooth, graceful curves rather than angles. The natural gait is a free-and-easy trot, but they can turn it up a notch or two and reach great speeds. body and gait suitable for the arduous work that constitutes its primary purpose. first premolars is a serious fault. forward rather than up and but little higher than the top of the shoulders, particularly in motion. clumpy ends due to ankylosis, are serious faults. A dog with a docked tail must be disqualified. dewclaws, if any, should be removed from the hind legs. Feet as in front. forelegs and hind legs has somewhat longer hair extending to the pastern and hock, respectively. Faults in coat include soft, silky, too long outer coat, woolly, curly, and open coat. with the dogs body sideways out of the normal straight line. should reach out close to the ground in a long stride in harmony with that of the hindquarters.